Clackmannan gets its name from an ancient whinstone boulder - the "clach" - which was named after "Manau", a Celtic sea-god. The area was once part of the territory of the Gododdin, descendants of Iron Age Votadini tribe, centred around what is now Edinburgh. 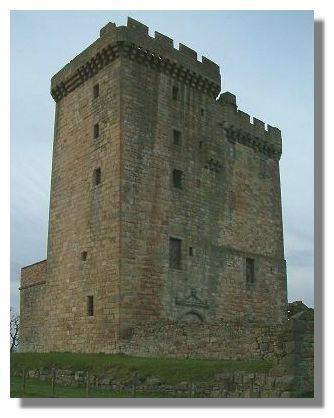 Clackmannan Tower stands stands on the site of an even older stronghold at the top a long ridge, which runs down through the town of Clackmannan below. The land was granted in 1360 to Robert Bruce, an illegitimate son of King David II (and thus a grandson of King Robert the Bruce). An original 14th century rectangular tower was added to in the 15th century by a taller square tower, creating an L-plan layout. The tower remained in the hands of the Bruce family until 1796. Catherine Bruce, the widow of the last Bruce owner (who had supported the Jacobite Uprising), used a sword which had belonged to King Robert the Bruce to "knight" important visitors - including the poet Robert Burns. or go to the next castle: Claypotts Castle, Dundee.